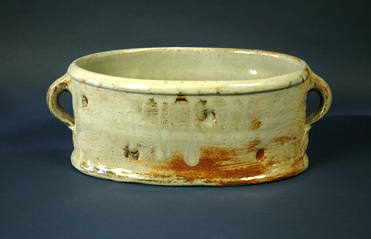 I began my career with clay in 1971 as a trainee thrower at Kingwood Pottery in Hampshire, England, where I was taught by a mix of art school graduates and old time plant pot makers. At this time I also attended part of the ceramics course at Farnham Art School, which was run by Paul Barron, and a onetime pupil of Bernard Leach;Henry Hammond . 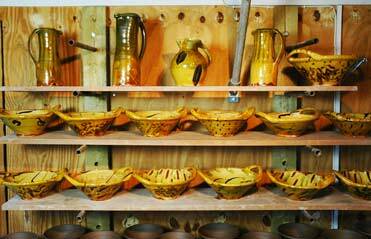 Here I gained a wider view of the world of clay. My present workshop was established in 1982, and for ten years I made terracotta garden pots and slip decorated earthenware. I also built my large wood-fired kiln. After a year spent working in New Zealand in the early nineties, I returned to England, and continued potting with more emphasis on glazed slipware, and more recently soda glazed stoneware, which now constitutes the major part of my production. My work is a continuing exploration of the potential of wood-fired ceramics, with the aesthetic and technical challenges of the medium creating a constant evolution of style and making practice. Current work consists of wheel thrown or slab built oneoff vessels, large jars, plant pots for interiors, and functional pots. I have exhibited widely in the UK and in France, and examples of my work can be found in private and public collections including the Fitzwilliam Museum Cambridge.